The love of my life is ten years older as well! I’ll never forget his age since it’s mine +10. Happy birthday Eddie! You are one lucky man to have these fancy cupcakes for your birthday! YUM! Happy Birthday Mr. How Sweet! Happy Birthday, Mr. How Sweet! You are the only other person that has mentioned having a slight infatuation with Alexander Skarsgard. I’m so glad I’m not the only one! Actually, I’d rather be the only so I have a better chance at nabbing him, haha. Do you watch True Blood? YUM! OMG. I’ve been obsessed with him since 2008. You have no idea. I just fell further in love with you because of this recipe. 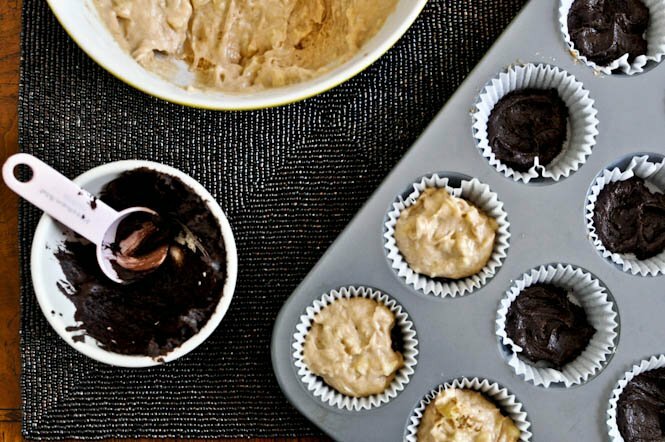 These look so good–like a chocolate banana milkshake in cupcake form! …or am i the only person in love with chocolate banana milkshakes?! Happy Birthday, Eddie! Hope you know that we are all in love with your wife and will steal her away from you if you ever turn your back ;) Cheers! happy birthday to your man! those cupcakes look fabulous! and even after only 2 years of being together, i’ve already resorted to food for my husbands birthday…i can’t think of a single thing he would want more! what a cute story, too! What a sweet post! Happy Birthday Mr. How Sweet…er, um…I mean Eddie. No- I mean Ed. Is Ed/Eddie short for Edward? I think I will still call him Mr. How Sweet-it has a nice ring to it! Jessica and Eddie-that has a nice ring to it, too! Happy birthday to Mr. How Sweet/Eddie/Ed! These cupcakes look delicious! i’m with him on the banana bread.. but i must admit these look yummy. These look absolutely amazing!! Happy Birthday to Mr. How Sweet!!!!!! 10 years seems like a big age difference, I can barely tell myself that 4 years isn’t too much, but I never would have guessed that you two were 10 years apart! And I do cringe every time I hear Mr. How Sweet. :) It’s kinda lame but you know i love you. Thank you! I think you’re the only one who came out and honestly said that and I can not agree more. I seriously cringe every time ANY blogger uses the word Mr. ______. Barf. I just made the brown sugar frosting and I can now die happy. Really. I’m missing 2 ingredients for the cupcakes so I’m off to the store. I think I need more brown sugar now too….Heavenly! I could not stop eating the frosting at all. So good! Happy Birthday to Mr. How Sweet (for me, he will always have that name ;)). And those Brownie Cupcakes looks delicious. I like that you call him Mr. HowSweet but I guess Eddie will do! Hope he enjoys those cupcakes they look great! I can’t even take all of this in! YUM! It’s nice to finally know your hubby’s name! Happy Birthday, Eddie! :) You are a lucky man to have this lady baking for you! Haha! You crack me up! Every time I try to do something special for my boyfriend for birthdays, holidays, etc something falls through or it fails miserably. But your right, if I have a yummy homemade treat then all is good! Happy birthday to your husband! I was sooooooooooo hoping that asterisk was going to denote a “grandpa joke”. My boyfriend is an old soul too. He makes what I call “grandpa jokes” all the time. You know what a grandpa joke is. Your grandpa makes them. Happy Birthday Mr. How Sweet! I made your browned butter peach crisp, and it was AMAZING. I love your blog! wow i want to eat these right now! They look so yummy! I can’t think of a better birthday treat!! Okay I have been reading this blog for a few days and finally thought uit was time to speak up! Perfect birthday treats! I forget birthdays all the time! HAPPY HAPPY BIRTHDAY TO U, MR EDDIE, HOW SWEET!! awwww I’m so glad you told us his name!!!!! hahaha Happy birthday Eddie! :) aka Mr. How Sweet! These look bomb.com. I told the man that I’m gunna make them. He said they don’t sound good. Sorry, but they sound f’ing amazing and I WILL be making them this weekend…even though I don’t even know what ripe bananas look like (ew). I have been reading your blog for years and have never posted before. But I have to say this post was so much fun to read and very very cute! Your food is always interesting and I love reading about your life, and your Mr. How Sweet and your grandma (Mother Lovett, I think?) God bless her. It’s nice to be able to relate to someone even when you don’t know them and they live so far away! (I’m in Toronto, Cananda!) Your blog makes me happy! Thanks for posting! Happy Birthday, Eddie! These cupcakes look very good! Ripe bananas and cupcake wrappers, check. I’ll be making these for sure! My hubby is 11 years older than I am…I like reminding him of that on pretty much a daily basis. I kinda agree with him on the banana bread thing…but these cupcakes look like I could forgive the rotten fruit because they have been conveniently saved by brownies and frosting. bah. I’ve been following you foreversss and ever since I found you I’ve been resisting the urge to creep you out with how alike I feel we are. Well, I can’t contain it any. more. Down to the Mr. Man who’s 10 years older, who only eats meat with a side of sandwich [sandwich translation: 2 plain (emphasis plain) chicken breasts sandwiching a protein bar], or the previously only Olive Garden boys, and a million and a half other things. I wish I lived closer. and could be your bff. and swap stories. so… yeah I <3 your blog! Those cupcakes look amazing and I really enjoyed reading about you and your husband! You always have great stories to share!! OMG this frosting on graham crackers is WONDERFUL btw. I posted a rough pic to your fb page of these! so great and even better cold the next morning for breakfast! I made these cupcakes today. AMAZING! I have to start giving them away to neighbors and friends or I will eat them all. p.s. Happy Belated Eddie! It seems like you are always posting such creative and delicious desserts, where do you come up with all these ideas?? I have been traveling for work for the last few weeks and just had the opportunity to come home to my kitchen and make these — YUM. I subbed box brownie mix + a dash of cinnamon and a tsp. of vanilla for making my own brownie base, and it was still delish. Plus I love the swirl of the brownie/banana bread layers when I bite in to it. This recipe is a keeper!! Thanks!